Happy belated New Year, everyone! For me, New Year in a time to reflect on the past and make plans for the future, and this one was no exception. I've been answering this survey for more than a decade now (here's last year's, here's 2014's, and here's 2013's) and I hope you enjoy reading it. If you decide to answer these same questions, leave me a link in the comments! Got engaged to a partner who makes me want to be a better person every day. Went to Asia! Lived alone! Became an Episcopalian! Went to the US Open! Went to the America's Cup! Bought a new car! Helped plan a baby shower! Went on vacation with babies! Moved to New England and hiked a whole bunch! In 2016, I wanted to live a little harder. I said, "I want to love harder and work harder. I want to be more conscious of myself and my surroundings. I want to buy only things I'm proud to own. I want to apply to grad school (again) and get more freelance work. I want to take better advantage of living in New York City, and I want to spend more time with my friends and family. I want to set big goals for myself, even if I don't reach them. I also want to buy myself a signet ring." Well, moving is hard and I didn't get quite where I wanted to be. But, I did really well at spending more time with friends, made more ethical purchases (though I wasn't perfect by any means), did get some extra freelance work, and maybe I'll get myself a signet ring for my 31st birthday. It's not a total wash.
2016 was so exhausting in some ways that I'm hesitant to really make any resolutions for 2017 beyond surviving wedding planning and adjusting to life in Vermont. There are other things that it would be nice to do (more writing, more photography, more focus on my health), but I feel okay setting the bar low. Shelby had the sweetest baby girl in March and I was so honored to spend some time with her the week after she was born. And, in May, Alana and Mered had twins! I could just gobble them up. Roger's grandmother passed away the week that we moved to Vermont. I didn't know her well, but Roger's mother was, of course, heartbroken, and seeing her in such pain was difficult. India! What a delight it was to travel to Delhi, Chandigarh, and Jodhpur for Tej and Caitlin's wedding. I can't imagine a better way to turn 30! We also visited my parents' new house in Florida, spent a week camping in the Adirondacks and Vermont for James and Emily's wedding, and then spent quite a lot of time traveling by car around New England and the Mid-Atlantic after we bought our new Subaru in October. In 2017, the travel should continue. We're planning to go to Latvia in the summer, and then on our honeymoon (not sure where yet) over Christmas. It's been ages and ages and ages since I was in Europe, and I'm so thrilled to be heading there in July. A little stability. Between moving to Vermont, living alone during the week, and my parents moving out of my hometown, 2016 left me feeling a little rootless and sad. I love Vermont, but it still doesn't feel like home, and I'm hoping that changes over the next year. I know, of course, that I should say the day we got engaged, and I'll never forget that, of course. But honestly, my favorite day of the year was when I played hooky from work and went to the US Open. It was one of those perfect New York City days that never seem to happen often enough. I felt more free and happy that day in Queens than I had in ages. Moving to Vermont. Leaving New York has been so much harder and sadder than I expected, and I don't think I quite understood how much courage it was going to take. But every day, I find that courage and start over, doing my best to stay undaunted. Also, I finally saved up enough to have a fully-funded emergency fund! Perhaps because of job and (eventually) moving stress, 2016 was not the healthiest of years. I'm already signed up for two exercise classes in January-March, and I have to start training for a half marathon right after that, so hopefully I can fix that in 2017! Luckily I was pretty healthy for most of 2016. I got myself a Barbour jacket for Christmas. I've wanted one since I was working at OUP, and once I moved here, I saw that they're extremely popular on campus, and had to have one. I did a crap job of budgeting the last few months of the year, and this was sort of the icing on the cake, but now I have an incredible jacket that will last a lifetime—and a resolution to stay better on track financially this year. Honestly, Roger and I exhibited some pretty excellent work ethic this year. For the first few months of the year, I was freelancing full time on top of working full time, and Roger spent the whole year freelancing, and at the end, commuting between Vermont on the weekends and New York during the week to make it happen. We have lots of big dreams (travel and a house and financial security, oh my! ), and I'm really proud of both of us for working incredibly hard to make them happen. Donald Trump and everyone who voted for him. I don't think I've ever been so devastated by a political outcome before. We get the leaders we deserve, I guess. I finally started spending only half my income on rent, groceries, and utilities! This was a major accomplishment, due to an increased salary and not, unfortunately, a decreased cost of living, even after the move to Vermont. After that, the majority went to a car down payment, travel ($5,000), and shopping and gifts ($3,000 - a record high for me, and something I'm really going to work on in 2017). I did manage to get my health and fitness budget down by about 50% from last year, and I think my food budget was lower than normal, although I'm not totally sure of that. Babies! I loved spending so much time with all of my friends' children. i. happier or sadder? A bit sadder, but I'm working on it! ii. thinner or fatter? Oh goodness, fatter, too. Working on that, as well! iii. richer or poorer? Much richer - my net worth went up about 41%. Writing. I thought coming to Vermont and the quiet would mean more poetry, and so far, I just haven't made the effort I should have. I spent a lot of time being anxious about work and my career, and I wish I had taken a minute to relax about that. I feel like I went very quickly through my job at NYU, and while I know I made the right decision to take the position I have no, I do wish I had been able to spend more time there before leaving. Oh, it was a bit sad. We had Christmas Eve at Liz's house with the whole gang, because my parents' house is empty and ready to be sold, and then had a brunch at Roger's parents' house before he and I left to go back to Vermont. No one had a tree because it's too much of a hassle. I cried, saying goodbye to my parents, and so did Liz, and then I cried more in the car on the way to Vermont. I know that whatever becomes our new normal will be a delight eventually, but I'm honestly tearing up a bit just writing this. 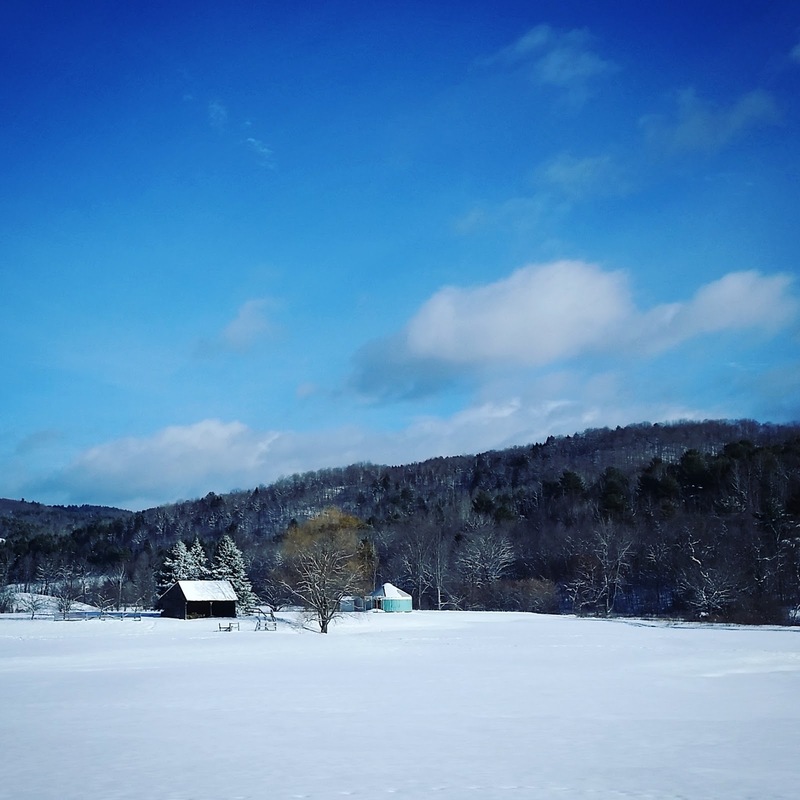 We spent Christmas week driving around Vermont looking at wedding venues and houses. I know that should be exciting, but it felt exhausting and sad, too. Yes! I'm so thrilled to be marrying the person I have loved with my whole heart for almost half my life in 2017. Living apart for the last few months has made me appreciate him even more and although I never feel sure about anything, I feel sure that being married is exactly the right thing for us. Oh my god, The Crown. I watched a lot of television this year, especially once I moved to Vermont, and The Crown was the best thing I saw, 100%. I also still love Last Week Tonight and The Walking Dead. But for me, it's all about The Crown. I didn't read as much as I wanted in 2016 (I wanted to read 40 and I read 26), but I did read quite a few good books. The Meeting House by Marilyn Nelson, Summer Doorways by W.S. Merwin, and We Mammals in Hospitable Times by Jynne Dilling Martin were highlights. I also read J. Courtney Sullivan's entire oeuvre. Will I make more time for reading in 2017? I sure hope so, especially now that I don't have Late Night Library to keep me honest! Spotify. Now I want to make our own wedding playlist! To move to New England. It wasn't made this year, but Nothing Left Unsaid was so intimate and touching. I also watched Grey Gardens so I guess this was my year for watching things about rich people. I turned 30 and ate dal so delicious I almost cried. We toured around Delhi a bit and then made our way to Agra to see the Taj Mahal. The hotel there had a birthday cake waiting for me in the room and I almost cried again. Honestly, I can't imagine a more perfect way to enter this new decade of adventures. But no, I didn't get myself the signet ring I had wanted to. Oh, it was pretty satisfying. I suppose a little more light through this first winter of living alone could have gone a long way, though. But, now we're back on that side of things and it will be light out again when I'm home before we know it. I did a lot of kind of heavy budgeting and it was nice to feel in control of something. In 2017, I just need to get some final investment accounts in order and I think I'll feel really good about where we are. Oh, Kate Middleton, of course. Will I ever love another? The presidential race. What a tremendous disappointment. Also, Brexit, inexplicably. My dream of everyone I love living in one apartment building continues to elude me, and so, I missed nearly everyone at some point this year. Oh my goodness, my friend Karen is such a delight! She has been the absolute sweetest person on earth about including me in her Upper Valley life, introducing me to her favorite yoga studio, and inviting me into her home. Side hustles, while a lot of work, can also be immensely satisfying and fun. "But if you close your eyes, / Does it almost feel like / Nothing changed at all?" 39. What are your plans for 2017? Get married. Buy a house. Put down some roots. Write some poems. Brexit making you sad makes perfect sense to me - Trump made us sad(and baffled!). Fingers crossed for a better year in politics!